In order to provide a consistently satisfactory user experience, in which users of the Library’s research databases (and the Summon discovery service) don’t face dead-end blank screens when trying to reach articles and books, the Library will deactivate Index-enhanced Direct Linking (IEDL) in our link resolver (360Link). Index-enhanced Direct Linking (IEDL) is available for certain article databases that cooperate with the company which provides 360Link. IEDL takes the user from a results list to an article or book without any kind of intermediate screen. From certain databases (and from Summon), IEDL was supposed to streamline the user experience by eliminating clicks between the search results and the items themselves. This has not turned out to be the case. Why did we make the change? For several reasons having to do with commercial relationships among various database vendors, IEDL used to function better than it currently does. Now, the inconvenience of the dead-end screens occurs much more often. The dead ends (blank screens) provide little or no useful information as to how the user can access materials the Library actually has. Always displaying the intermediate “Get it @ Midd” screen will allow users to see our accurate holdings and to obtain access consistently. 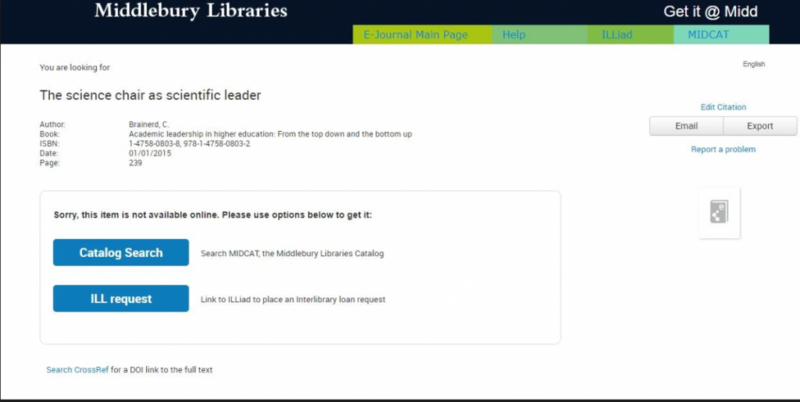 Please feel free to comment below or send questions to the Midd librarians at http://go.middlebury.edu/askus . This entry was posted in Midd Blogosphere and tagged 360 link, databases, discovery, Get it @ Midd, How do you use the library, IEDL, library, library databases, library systems, linking, research, Summon on January 4, 2019 by Bryan Carson. The ILLiad web pages will be down from 9:00 am today while we upgrade the ILLiad software to v8.7. The ILL web site will be inaccessible for only a short time, assuming all goes well with the update. If anyone has problems after 2:00 pm please contact Rachel Manning at x5498 or rmanning@middlebury.edu for assistance. This entry was posted in Midd Blogosphere and tagged ILL, ILLiad, interlibrary loan, libitsblog, library, libspotlight, Middlebury Community Interest, upgrades on September 20, 2016 by Bryan Carson. Library Systems will be performing necessary security upgrades to the EZproxy server on Sunday morning during regularly scheduled downtime (6 am to 10 am) on 4/12/2015. There will be no off-campus access for the Library’s subscription databases, e-books, and e-journals during this time. There will be intermittent access interruptions on campus, too. I expect the whole process to last no more than one hour. I apologize for any inconvenience. This should be done by 10 am. This entry was posted in Midd Blogosphere and tagged downtime, EZproxy, Helpdesk Alerts, Library Spotlight, library systems, libspotlight, LIS Staff Interest, Middlebury Community Interest on April 10, 2015 by Bryan Carson. The website Digital Collections at Middlebury is down for necessary maintenance on Monday, December 8, 2014. We apologize for any inconvenience this might cause. This entry was posted in Midd Blogosphere and tagged contentdm, library, Library News, LIS Staff Interest, lisblog, Middlebury Community Interest, website maintenance on December 8, 2014 by Bryan Carson. Something one just needs to read. Nice images, too! This entry was posted in Midd Blogosphere and tagged LIS Staff Interest on June 13, 2014 by Bryan Carson. Summon, our library resource discovery layer, now has a new and improved interface. In the 6/3/2014 update, the vendor (ProQuest / Serials Solutions) made several bug fixes that we had been eagerly awaiting. Even more importantly, the changes offer better layout, better integration with our library research guides (LibGuides), and context-sensitive librarian information on the results pages, among other things. You can access Summon from the same places you always could. This entry was posted in Midd Blogosphere and tagged LIS Staff Interest, lisblog, Middlebury Community Interest on June 13, 2014 by Bryan Carson. Many professors and students gravitate to Google as a gateway to research. Libraries want to offer them a comparably simple and broad experience for searching academic content. As a result, a major change is under way in how libraries organize information. Instead of bewildering users with a bevy of specialized databases—books here, articles there—many libraries are bulldozing their digital silos. They now offer one-stop search boxes that comb entire collections, Google style. That’s the ideal, anyway. The reality is turning out to be messier. Dartmouth Pops the Champagne as Basic Programming Language Turns 50 – Basic, the programming language that revolutionized computing by making it accessible to people beyond the worlds of science and engineering, turns 50 this week, and it’s getting a birthday party. How the 5 hottest tech jobs are changing IT – The IT industry is shifting. Here are five jobs coming to the forefront and how they are transforming the IT department. How to Delete Yourself from the Internet – You can make yourself “disappear” from the Internet. But be forewarned: Most of the following tactics are irreversible. Flipped learning skepticism: Is flipped learning just self-teaching? This entry was posted in Midd Blogosphere and tagged articles & presentations, library collections, LIS Staff Interest, lisblog, Research & Collection Services on May 2, 2014 by Bryan Carson.